I'd cracked the puzzle: found the to-do list, cleaned the coffee machine and located the Warden's mug. To complete the memory I just had to place it on his desk, which I did, expectantly. Bugger all happened. Somewhere in Ether One's story I'd skipped a line, too dense to connect the clues I was given. I felt daft. Ether One's lateral challenges are not Myst's. Making sense out of Myst demands the mind of a prodigy and a diet of LSD. When Ether One has you stumped, you're missing the obvious. For an adventure puzzle game that's the Holy Grail. In one instance, my keen mind perceived how to jerry-rig a lift. Attaching the right cables, I stepped back to reap the fruits of my intellect. It screeched its way up the shaft at an angle sub-optimal for human ascension. Having failed to right it some hours later, I declared it bugged (with expletives) and cut off its power by way of revenge. The ropes went slack, and the lift levelled off. Ah. Turn it off and on again. And there was me scouring the level for a 'lift cog', 'winch motor' or 'elevation fuse'. Trained in game logic, I'd forgotten about physics. This is the case throughout Ether One's generous helping of mind games. Solutions are a matter of paying attention – keep your eyes open and a coherent, logical solution will be found for each puzzle. If you're guessing, you've gone wrong. That's not to say they're easy. Ether One packs a good 20 hours' play for the chronic underachiever. If you choose to engage it, that is. Should your think tank spring a leak, you can skip any puzzle that bests you. Ether One trusts the player. It gives you leave to wander its world, taking in the story as you will. Avoiding the asides, you could finish in a fraction of the time. That's masochism, of course. Skip out on the extras and you'll miss the meat of a tragic human narrative: a saga of dementia, death and industrial decline that is discovered rather than told. Ether One drops you, Inception-style, into the subconscious mind of a demented patient. You wander through their memories of Pinwheel, a 20th-century mining town, restoring order where the illness has taken hold. The writing is so earnest that it's easy to imagine that it has roots in first-hand experience. Pinwheel is as much a character as the cast. Low-poly, hand-painted models act as a clever concession to budget while serving the plot. 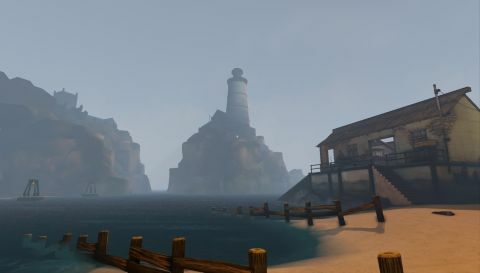 Think World of Warcraft meets Dishonored: painterly with a point. Painting is a recurring motif, and the concept of the world being recalled from memory ordains a happy marriage of story and surroundings. Take the Case, your combined mission hub and locker room. Pick up an item in the world, warp to the Case with the tap of a button and add it to the shelves lining the walls. It's no thankless task to pad out the puzzles, but a savvy reinvention of the inventory. A few hours in you'll have amassed a collection of curios beyond comprehension. The instinct of the hoarder to take everything that isn't nailed down lest it be needed later is encouraged by a visual space in which to consider your finds. This strange library reinforces Ether One's theme of dementia: you can't guess at these objects' purpose beyond a sense that something here might be important to you. The ending sits in contrast to a game of impressive freedom. In the final half-hour, Ether One forgets its free-form puzzling. It worries that you've missed the story teased at on your journey and decides to rectify that. It sits you down, bids you be quiet, and lectures on the details in a fit of exposition to rival Bioshock Infinite. It's unnecessary; a blunt-force ending to a game which should have left us guessing. There's no shortage of bugs, either. Items morph into textureless cubes on a whim. The limited draw distance caused one industrial puzzle to collapse. They're more often irritating than game-breaking, but they prevent Ether One scoring higher than it might.